The Flamin' Groovies had been around since 1965, but in 1976 they hadn't released an album since 1971's "Teenage Head". They returned with this album, almost like a new, different group, leading many, including myself, to think that they were a new group, formed on the cusp of the burgeoning punk and "new wave" movement. Their "new" music was one heavily influenced by the "British Invasion" guitar rock of the pre-psychedlic days, with a lot of Byrds-style jangly style guitar from the same period. The title track was a catchy r'n'b-ish beaty romp, marred by a tiny bit of tape hiss at the very beginning, during its riff that surely U2 used for "Beautiful Day", but once the bass and drums kicked it didn't matter. "Sometimes" sounded a bit like a throwaway sixties 'b" side, with a bit of a muffled sound, while "Yes It's True" is so 1963-64 Beatles its almost embarrassing. The Groovies certainly wore their influences on their sleeves for all to see. "St. Louis Blues" had a pure Chuck Berry guitar into and that sound of a British r 'n' b band doing a Berry cover, despite being American, they were constantly channelling their British side here. This sort of upbeat stuff found The Groovies aligned with British "pre-punk punks" like Eddie & The Hot Rods, Dr. Feelgood and The Kursaal Flyers. Even the cover showed them posing in front of some typical British sixties architecture and looking mean and body in their dark suits. I remember seeing this cover and immediately thinking they were a UK group. They played gigs on the punk circuit (I saw them live a couple of times) and they were soon bracketed alongside The Ramones and Blondie as somehow being part of the US punk scene, which was inaccurate. The description of them as a forerunner of "power pop" was certainly true. "You Tore Me Down" and "Please Please Girl" are both very Beatles-ish, the latter being more rocky. "Let The Boy Rock And Roll" is upbeat rock and roll in the manner of British rock producer Dave Edmunds. Edmunds had a bit of a "wall of sound" fixation and this was obvious on the crashing backing to "I'll Cry Alone". "Misery" is an obligatory Beatles cover, sounding a bit less dated than the original, to be honest. "Don't You Lie To Me" is a big, bassy and bluesy Dr. Feelgood sound-alike. A cover of The Rolling Stones' "She Said Yeah" is no surprise either. "I Saw Her" is actually a bit Doors-style trippy and "Teenage Confidential" is very much mid-sixties Rolling Stones influenced, even down to its use of an Eastern-sounding guitar. It also has echoes of the keyboard sound that Them used in the sixties too. "I Can't Hide" is a powerful, thumping rocker to end on. It is an enjoyable, frantic thrash of a highly derivative album, with some dodgy sound in places, but an energy and joie de vivre that is pretty irresistible. Now firmly seen as part of the "new wave", this follow-up to "Shake Some Action" was pretty much more of the same mid-sixties influenced jangly guitar "power pop". There are a lot more cover versions on this album, however, making one wonder if the group were treading water somewhat. The Byrds' "A Whole Lot Better" is a convincing cover to start with, though, and "Between The Lines", although an original song, sound so much like The Byrds so as to almost be a cover. There are hints of early Tom Petty & The Heartbreakers. The Dylanesque rock of "Ups And Downs", a cover from a group called Paul Revere And The Raiders, who I have no knowledge of is delivered with a punky swagger. Cliff Richard's "Move It" is covered excellently with a huge drum sound. Overall the sound is much better on this album than on the previous one. "Take Me Back" is a Beatles-esque mid tempo rocker with a Searchers/Byrds riff. "Reminiscing" is a King Curtis cover and is delivered in a punchy, bluesy style. "Good Laugh Mun" is another harmonious Byrds/"Aftermath" era Rolling Stones influenced number. "Yeah My Baby" has a Velvet Underground-style intro, sort of like "Waiting For My Man", with some slight T. Rex riffage in there too at one point. "House Of Blue Light" is a great rocker. "Blue Turns To Grey" is a good cover of a Rolling Stones rarity, but "Paint It, Black" is too well known in its original form to work quite as well. "All I Wanted" is lively and Beatles-esque with some killer guitar in the middle. "Don't Put Me On" is an excellent one, one of my favourites. Finally, The Beatles' comparative rarity, "There's A Place" is lively and appealing. To be honest, there was so much new, vibrant creativity around in the late seventies that a group so retro in its approach was not really necessary. That is probably why The Groovies didn't really make it fully. Listening to them now, however, they sound great. Like a sixties group though. 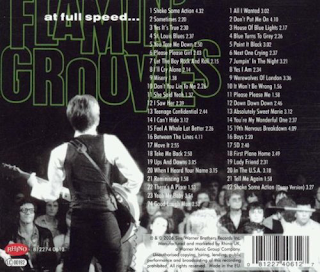 By 1979, the sixties guitar pop revivalist groove of The Flamin' Groovies was starting to wear a bit thin. From 1976 to 1979 they certainly had some glory years on the coat-tails of punk and new wave, but, as energetic and enjoyable as this album undoubtedly is, maybe the writing was on the wall. The title track is a rousing Dr. Feelgood-esque rocker, while "Next One Crying" is so John Lennon circa "Imagine" its barely believable. Despite that, however, I can't help but enjoy it. "First Plane Home" sounds, for me, like The Rolling Stones from the mid sixties meets mod-revivalists Secret Affair. It has a big, pounding rock sound, though. "In The USA" is a Chuck Berry derivative with a Status Quo-sounding vocal delivery and riffery to it. "Down Down Down" is very much in the style of previous producer Dave Edmunds. New producer Roger Bechirian went on to produce Elvis Costello's "Trust" in 1981 and you can hear influences from this on that album. "Yes I Am" is a solid, punchy mid-tempo rock number of its time. Now it's time for the covers. Warren Zevon's "Werewolves Of London" is ok, but it loses some of its piano-driven appeal and becomes a plodding rocker. The Byrd's "It Won't Be Wrong" is strong and solid, but was there any need for Byrd's covers in 1979? The Beatles' "Please Please Me" is as rocky as it should be. I remember The Groovies playing this live and it was excellent. "Tell Me Again" is a Groovies original with a Tom Petty feel to it. Bob Dylan's "Absolutely Sweet Marie" is actually very convincingly covered, at breakneck speed with swirling organ and frantic drums. It's great. The Byrds' "5D" and "Lady Friend" are both enjoyable, but, as I said, was there any need for them? 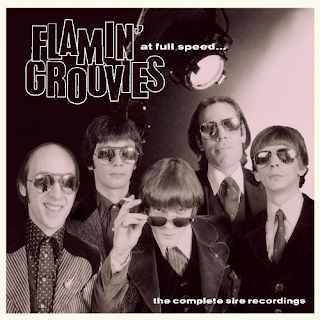 The Flamin' Groovies would not release another album for eight years.